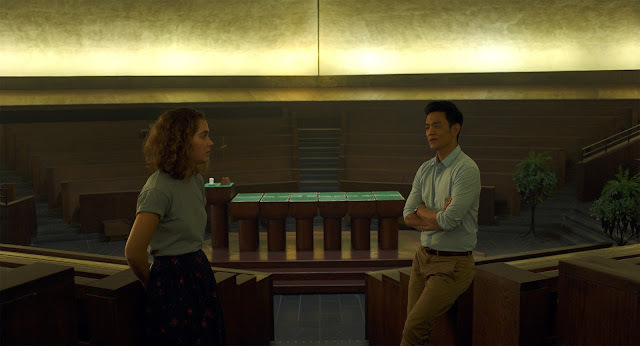 As I was leaving the theater after seeing Kogonada's debut film, Columbus, my friend Stef mentioned that she enjoyed the movie, describing it using a line one of the characters in the film used to talk about the appeal of modernist architecture: "It was asymmetrical, but balanced." It's the kind of comparison that, it could be argued, only makes sense after you've seen the film, which uses modernist architecture as a kind of thematic touchpoint and visual cue; you have to feel the way the movie twists its emotional through lines to really grasp it. But it's also the kind of movie about which one might reasonably walk out saying, "It was asymmetrical, but balanced." Kogonada, a Korean film essayist making his debut feature, has crafted a movie that is intricate and intellectual, a thoughtful look at two damaged souls trying to find some measure of comfort with one another. 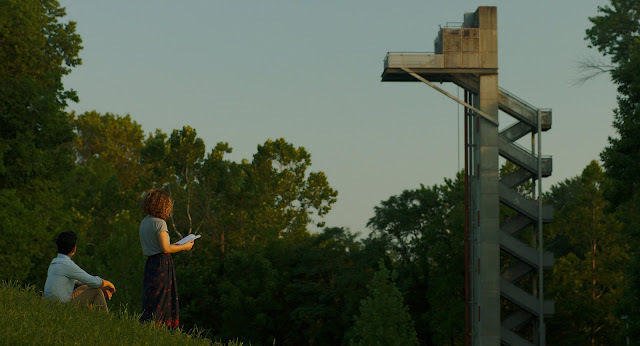 In Columbus, Casey (Haley Lu Richardson) is a bright young woman trapped in the small Indiana city of Columbus, a place largely known for its historical importance in the modernist architecture movement. It was this architecture that drew a renowned, aging academic to the town to give a talk about modernism and work on a new book. 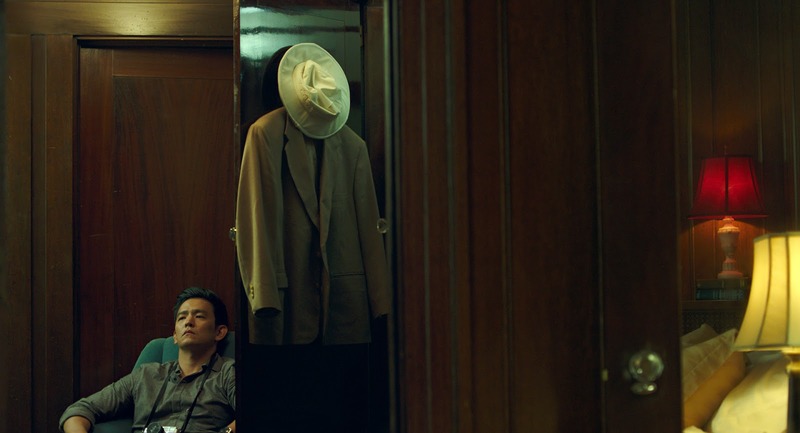 But when he passes out and is rushed to the hospital, his estranged son, Jin (John Cho), leaves Seoul for Indiana. Jin and Casey strike up an unlikely friendship, each dealing with parental issues and an uncertain future, and the film follows their winding conversations as they try to navigate, and help one another navigate, the purgatories they find themselves in. Essentially an extended dialogue between Casey and Jin for enormous portions of the film, Richardson and Cho have to carry the film. With Cho (Star Trek Beyond), a seasoned professional and one of Hollywood's most chronically underused leading men, this was almost never in doubt; Cho has an effortless charisma and confidence that makes him magnetic to watch, even as his character is in uncertain emotional waters and slipping into something like desperation. Jin could have easily been an insufferable character, a maudlin mess of a man prone to whining about his responsibilities and making... let's say 'questionable' romantic decisions. But Cho gives him a soulful sadness that is one of the film's most powerful emotional beats; in one particularly gorgeous silent scene, he gets across his uncertainty and aching misery in the few, brief motions of taking a drink and sitting down, his father's silhouette hanging over him in judgment. Richardson (The Edge of Seventeen) is more of a newcomer, with only a couple prominent roles under her belt. In some ways, her character is familiar: She's a bright young girl trapped in a small town by family responsibility, forced to watch all her former friends leave as she stays home to take care of her mother. But Richardson plays her with none of the quirks we've come to expect from the type. She's smart but not snarky and hyperverbal and not looking for a coming-of-age fling with an older man; instead, Kogonada has her play up the weight of her responsibility, the heaviness of missed opportunity. She's someone who is ceaselessly interested in the world around her, but who doesn't believe it holds any future for her beyond that idle interest. If Cho plays sad as soulful, Richardson plays it manic, as a desperation to fill herself up as things go wrong. The film's other stars are Kogonada, who edited the film, and Elisha Christian, the cinematographer. The pace of Columbus occasionally feels glacial, thanks to the abundance of mid-range static shots that so dominate much of the film. But those static shots are often immaculately composed, using the architecture of Columbus, Indiana and the positioning of the characters to powerful emotional effect. Kogonada's editing pulls that positioning together, using it to create an intimacy that isn't really there or holding on the music and background chatter long after we've left the scene where they were present, a sort of social hangover that defies, and then enhances, one of the film's saddest scenes. The choices made by Kogonada and Christian in framing and cutting the film may slow the film, but they also make room for a wordless depth that fits the film's themes well. In a way, Columbus is a formalist dream sitting at the crossroads of Sofia Coppola's Lost In Translation and Richard Linklater's Before... trilogy, a talky two-hander in which two interesting souls meet briefly, have a series of fascinating conversations, and influence one another in unexpected ways. Kogonada's film is slower than either of those, more interested in the experience of their day-to-day routines... and, perhaps, a little less interested in the emotional gut punches that made those movies so evocative for me. But Kogonada's thematic rigor pays off, finding a depth of feeling in some of the quietest, loneliest moments of Jin and Casey's lives. It seems weird to call a film that repeatedly has characters state its themes out loud subtle - Rory Culkin's desperately-trying-to-be-a-cool-librarian performance utterly saves the film's clunkiest but most thematically definitive line, "Are we losing interest in everyday life?" - and yet, in the end, that's what I must do. Kogonada, for all his thematic bluntness, never overstates and overexplains his characters, allowing the framing, editing, and performances to say what the dialogue never could. In the film's larger moments, this can be breathtakingly tense. But even in the smaller scenes, like one in which a character makes a dumb, goofy architecture joke and then never explains it to make sure the audience 'gets' it, it leads to a movie you can sink into, if you let yourself, a calmly empathetic exploration of a town and two people that sticks with you long after it's finished. Columbus debuted at Sundance in early 2017, and is currently in select theaters across the nation. Written and directed by Kogonada, Columbus stars John Cho and Haley Lu Richardson.